From the 'Large English Atlas'. 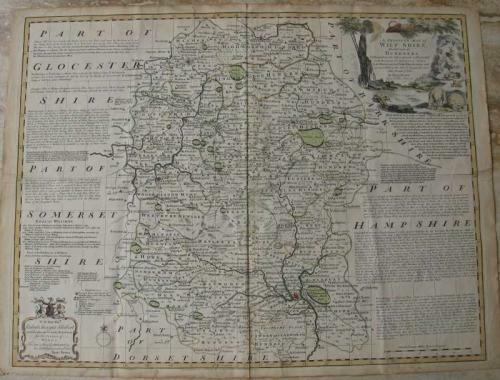 An original antique map of Wiltshire in England engraved by Emanuel Bowen and published by Carrington Bowles in the "Large English Atlas" printed in London, 1753 (see below - do not confuse the image with map being offered here!). Fascinating script describing highlights of the County and principal towns. Decorative cartouche and dedication coat of arms honoring the Lord Lieutenant of Wiltshire. Good condition for its age and size with some age toning and old repaired tears to the border with a 3 inch separation at the fold. Original and later coloring - the cartouches were not colored at the time of publication. Map size 29.5 x 22 inches with vertical and horizontal folds. The Large English Atlas of Emanuel Bowen and Thomas Kitchin comprised maps compiled between 1750 and 1760 that bridged the gap between the small and pretty, and the large and detailed. Produced on a larger format than before and with vignette panoramas, inset plans and panels of extensive text describing the towns and economic activities of the county shown, these maps were the best of the time - their popularity attested to by the many reissues of the atlas over forty years.